When your travels bring you to the island of St. John, you must spend a day exploring the Virgin Islands National Park. The park sees over 500,000 visitors each year and covers two-thirds of the tiny 9×4 mile island. The Virgin Islands National Park is home to over 20 hiking trails, an enthralling plantation history, and some of the most beautiful beaches in the world. Enjoy a day at the Virgin Islands National Park beaches relaxing under breezy palms. Or be adventurous and go snorkeling in the crystal clear ocean water after hiking a trail. Whatever you decide to do, this stunning park is sure to be a significant part of your St. John vacation! For more information on the Virgin Islands National Park and other recreational areas on the island, view our Activities Guide. It features some of our recommendations at CimmaronStJohn of the best places to visit during your vacation! Uncover the past during your visit to the Virgin Islands National Park. The park is home to Annaberg Plantation and Reef Bay Sugar Mill, both of which are open to the public. Annaberg Plantation was one of the largest sugar plantations on the island of St. John. At this premier historic site, you will find a trail that leads to the slave quarters, the windmill, and other pieces of the factory. Tuesday through Friday, visitors are allowed to participate in activities at the plantation, including basket weaving and making “dumb bread.” Along the Reef Bay Trail, you will see the Reef Bay Sugar Plantation. These remains are very well preserved and show how the sugar factory operated. If you hike any of the trails on the Virgin Islands National Park map, then hike the Reef Bay Trail. Along this gorgeous 3-mile trail, you’ll see freshwater pools, lush forest landscape, and a 40-foot waterfall complete with petroglyphs dating back over 1,000 years ago. Contact the Virgin Islands National Park to make arrangements for a guided tour, including a boat to pick you up at the trail’s end following a swim at the beach at Reef Bay. To hike to the highest point on the island at 1,277 feet above sea level, check out the Bordeaux Mountain Trail. Along the trail at the intersection of Centerline Road and Bordeaux Mountain, you’ll find a breathtaking view. Trunk Bay Beach has been named one of the 10 best beaches in the world by Conde Nast Traveler magazine. And for good reason! With its crystal clear waters and white sandy shorelines, it is no wonder this is a hot spot on St. John. A highlight at Trunk Bay is the 225-yard long underwater snorkeling trail. You will also discover some great amenities here. There are chair rentals, watersport equipment rentals, and a snack bar. Admission to Virgin Islands National Park is free. However, there is a $5 fee to enter Trunk Bay Beach for the day. After Exploring, Settle Into Your Private Vacation Home! Whether you like to relax on the beach or stay on the move by hiking and snorkeling, you’ll enjoy a day spent at the Virgin Islands National Park. After all that fun in the sun, you’ll need a place to unwind on your vacation getaway. 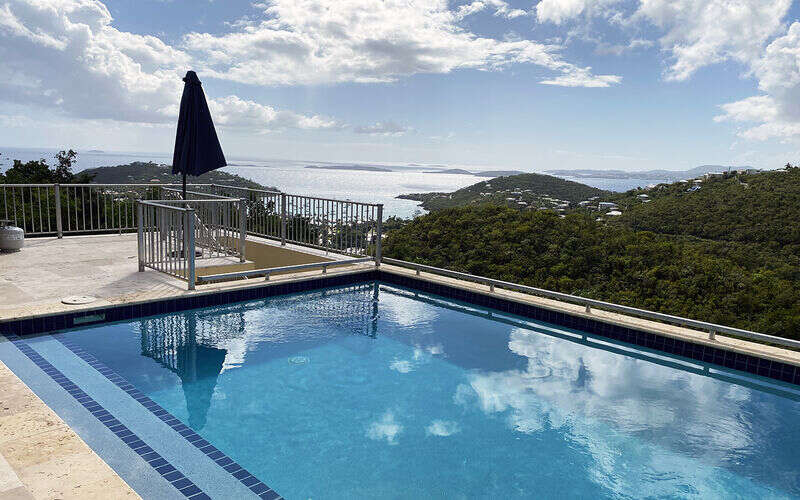 Here at CimmaronStJohn, we have luxurious vacation rentals ranging from a studio condo to a 6-bedroom villa, all with amazing ocean vistas. We are there every step of the way when planning your trip to St. John. From your arrival at the airport to helping you plan all the fun activities St. John has to offer, our Guest Services team is here to help. For more information on how to start planning your trip to St. John, contact us at 340-715-2666. We look forward to hosting you here in paradise!